Our readers’ choice for the architectural icon that best represents Sarasota’s unique sense of place. Earlier this summer, we asked readers to choose our 2018 Spirit of Sarasota Architecture Award winner from among 10 iconic new buildings that had already been recognized by the AIA Florida Gulf Coast Chapter with its biennial Design Awards. Our Spirit of Sarasota award honors a new building that captures the evolving character of our culture-rich and increasingly diverse community—and this year’s entries were exceptional. More than 1,400 readers weighed in. And the winner is, with 32 percent of all votes cast…The Venice Residence, designed by Halflants + Pichette Architects. 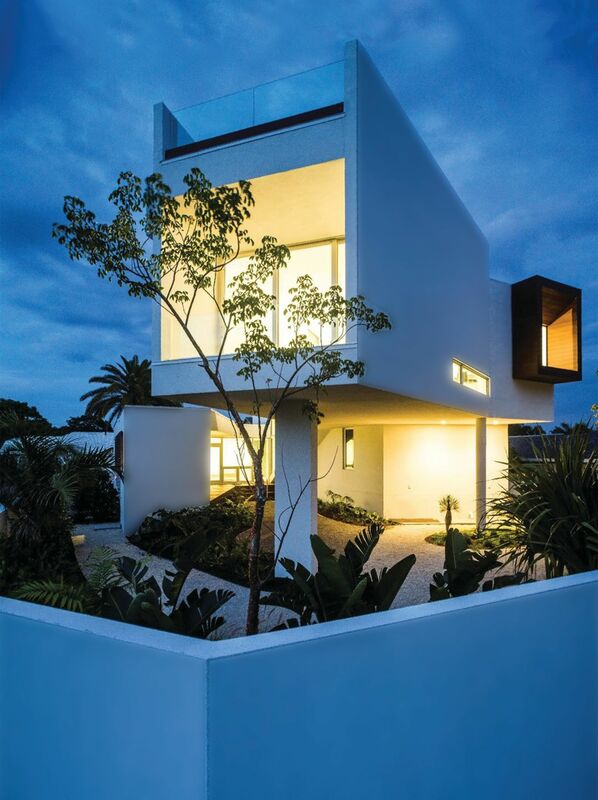 This contemporary home with two wings connected by a courtyard is set on a 50-foot-wide site one house removed from the Gulf. A larger residence obstructs the water view. The architects took advantage of two view corridors through the setbacks of the neighboring lots so the owners would have a view from the living room that looks northwest and one from the kitchen that looks southwest—corresponding to the summer and winter sunsets.